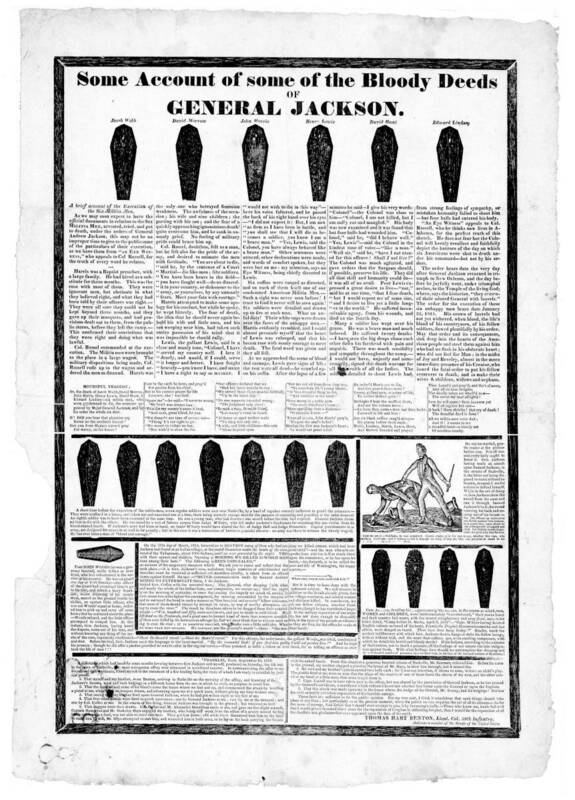 One of the “Coffin Broadsides” used by John Quincy Adams’ campaign against Andrew Jackson in the presidential election of 1828. It was a pleasure last night to be part of the 6pm group for the Friends of the Cabildo’s preview of Battle of New Orleans artifacts last night. Mr. Wayne Phillips, Curator of Costumes and Textiles, gave a great presentation, explaining the items on display. 1. I got two good ideas for GoNOLA.com columns. 2. It was nice to see the originals of many items that I’ve got images of. LSM put out three original “Coffin Broadsides” from their collection, since those are related to Jackson. I’ve got scans, yes, but it’s always cool to see the paper. Would it make a difference in terms of research? Probably not, since a hi-res scan is more practical to work with anyway. Same goes for several maps shown last night. 3. I got a GREAT idea for a fiction piece, dealing with the FBI agent character I’m nurturing along.